The 379rd Master Cutler, Kenneth Cooke, was installed in a formal ceremony this week, in keeping with tradition and maintaining the unbroken line of Master Cutlers since 1624. The ceremony at the Cutlers' Hall and Sheffield Cathedral was attended by several hundred Freeman, Friends of the Company and specially invited guests. Ken Cooke, who was born in the East End of Sheffield and was educated at the Central Technical School and Granville College, is the sole owner of CTW (Hardfacing) Ltd. The role is seen as an ambassador representing the industries of the Sheffield city region, both nationally and internationally. Cooke began his career in engineering / manufacturing at the Central Technical School in Sheffield and was fortunate enough to complete an apprenticeship in the highly regarded training centre at Edward Pryor's. After three years of day release and evening classes at Granville College his overwhelming desire was to start his own business and eventually CTW Hardfacing was formed, servicing manufacturing companies with wear / heat / corrosion / impact resistance metal coatings. Over the years he formed a total of six companies, all supplying engineering services throughout the UK and Europe. Ken Cooke, Master Cutler, said: "For business and the country, the coming year will be full of uncertainty. Although there has been a huge amount of speculation as to the outcome of the Brexit negotiations that is all it is – speculation. None of us really knows what is going to happen and how good or otherwise it will be for any of us. 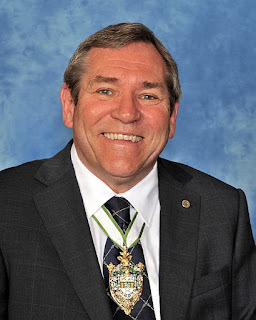 "During my term of office as Master Cutler my prime aim will be to support the Cutlers' Company in promoting the Sheffield city region, pointing out its potential, opportunities, qualities and values. This is my city and I intend to make sure everyone I meet learns to value it as I do."